Here it is. Finally. I know you’ve all been waiting eagerly for this. What? 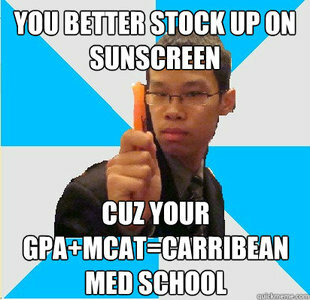 The ultimate guide to surviving (nay, thriving) in your fourth year of medical school at the University of the West Indies, Mona. It’s a harrowing year. Five blocks of thirteen clerkships, some of them running concurrently. Where will you find the time to eat, sleep, live a little? But don’t despair. You can actually enjoy fourth year here. *Disclaimer: You will see the golden seam of my bias toward Montego Bay (home) and the Cornwall Regional Hospital running strongly throughout this post. Just embrace the fact that Cornwall > UHWI. Learn as much as possible about common gestational problems and emergencies. You definitely want to aim for Cornwall Regional Hospital or Mandeville Regional Hospital, which excel at the practical aspect (i.e. catching babies). Lots of babies, limited baby-catching competition. You can easily complete all your deliveries on site. At Kingston Public you’ll be competing with midwifery students (scary!) and at UHWI there are comparatively fewer babies to catch. Bonus! Kingston Public has a super-dedicated, totally great post-DM resident who loves students and will teach you everything under the sun if you can pin him down. Like a leprechaun, only instead of gold you get good grades. This rotation was only offered at UHWI and CRH in my year (2015). Hands down, Cornwall was the better choice. You end up competing with six students instead of thirty, and in one morning you can see a kajillion times the patients UHWI sees in a day. Procedures are endless, the teaching is superb (dedicated, nice consultants. Not that the UHWI consultants are mean. It’s just that, well, Cornwall rocks), and you don’t have to fight to the death over catheterization sets. Mostly because there aren’t any. Ha. I only wish I had stayed awake for at least one of my Radiology classes because we got some great teaching from one or two people while I was catching z’s. Medicine and the Humanities is pass or fail so the most I can sell is the sheer entertainment of listening to one of the lectures ramble on about the history of Rome. Which is hilarious now, but later on in another clerkship you will wish he would teach the subject at hand. Less hilarious at the time, but still pretty hilarious in retrospect. (I really hope I passed). Part One of a two-part post on “Hey, look what I did!” To be continued . . . later. Do you agree, disagree? Tell me in the comments! ← If brevity is the soul of wit, does that mean short people are really clever? How could I forget the hot residents?! Hi Robin, a prospective uwi mona mbbs class of 2019 here. I’ve spent the last few weeks reading all of your med school posts and have enjoyed every word. You write really well. Being a single mom, I was wondering what the class schedules are like during the first 3 years. I just need to have an idea of the times I will be in class. Thanks so much for sharing so many of your experiences at uwi and all your pearls of wisdom. The first two years are spent in lectures which usually run from 8AM til about 1PM on average. The rest of the day is devoted to tutorials, mostly Anatomy, which usually run into the evening 2-3 days a week. In the third year we start rotations at the hospital which can be very demanding. We’re supposed to be at the hospital from 8-4 every day, with occasional duty nights where we stay til 10PM. Some of the time is for dedicated learning sessions but a lot of it is self-directed learning. It’s so strange that there isn’t a lot of information on the web about personal experiences in this programme. So trust me when I say your blog is providing information to a plethora of hopefuls, like myself. I’m still unsure how this government sponsorship goes. I was under the impression that all Jamaican citizens qualify for the sponsorship. But I was recently told that only exceptional applicants qualify. Now I don’t know what to believe: if they were talking about scholarships or the sponsorship. I mean, there is a big difference in trying to source 600K and 2.7 million, you nuh? The Jamaican sponsorship has changed in recent years because we have an overwhelming number of Jamaican applicants now (and our government is broke). (Unlike Trinidadian and Barbadians who are still mostly sponsored). Now you can apply to get up to 50% of the sponsorship, but not everyone will get the full 50%. I believe these are called “bursaries”. I think selection is based on academic merit, but possibly also co-curricular involvement? The Faculty of Medicine (in particular the Dean) would be able to advise you better. Scholarships are totally different offerings provided by the Office of Student Financing which has a website you can look at.